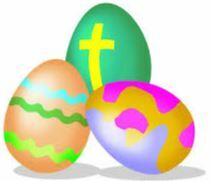 Families & their 4-10 year olds explore Easter through craft and a shared meal on Good Friday, 19th April 10.30am-12.30pm. This is for families to attend together; children accompanied by adults, adults accompanied by children. A voluntary donation of £2 for lunch would be appreciated but is not mandatory. Some activities are messy so children should bring with them: An apron or overall and A bag with their name on to take things home. Please contact us to book a place by Friday 5th April.Please supply your name, email/phone, number of children and their ages, number of adults, dietary requirements/allergies, whether you are happy for photos to be taken of your child/children during the session.